Hey Obama, Whadya Say, How Many Kids Did You Kill Today? Defeat Imperialist War/Occupation in Afghanistan and Iraq! Afghan students protest wanton killings of civilians, particularly youth, by U.S./NATO occupation forces. On April 12, U.S. troops opened fire on a passenger bus full of civilians near a check point in southern Afghanistan (Kandahar province). Five civilians were killed and as many as 18 were wounded (New York Times, 12 April). That same day, hundreds of demonstrators went to the site where the wrecked bus was taken and angrily chanted slogans against the U.S. and Obama. A week later, a NATO military convoy in eastern Afghanistan (Khost province) fired on a vehicle carrying unarmed civilians, killing all four passengers, including three teenagers. This makes at least 35 civilians reportedly killed by occupation forces since last summer. These are common and recurrent events in the everyday lives of the Afghan people. But the latest attacks on civilians by the U.S.-led forces were notable coming shortly after the release of a “classified” U.S. military video of a massacre in Iraq. On April 5 the web site WikiLeaks put up the now-infamous video depicting the indiscriminate slaying of over a dozen people in the Iraqi suburb of New Baghdad, including two Reuters news agency staff. In the video, U.S. helicopters gun down a group of people standing calmly in a Baghdad street. The helicopter team calls a video camera an AK-47 assault rifle, a tripod is labeled an RPG grenade launcher. Then they proceed to systematically shoot down the people who come to rescue the victims, including two children. We can hear on the radio the commander denying a request to airlift the wounded children to a U.S. military hospital, instead ordering them handed them over to the police of the Iraqi puppet government. Later on, the video shows the same helicopter firing missiles at a construction site, where families were living in partly finished apartments. This was cold-blooded murder. During the Vietnam War, antiwar demonstrators used to chant about Democratic president Lyndon B. Johnson, “Hey, hey, LBJ, How many kids did you kill today?” Now they should be chanting the same about another Democratic president, Barack Obama. But they aren’t. 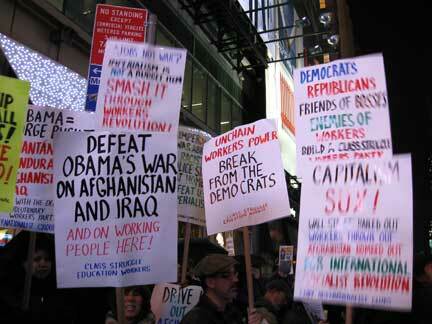 In fact, there have been hardly any sizeable antiwar demos since Obama became the candidate. Why not? Because the “antiwar” forces either openly or tacitly supported Obama. Iraq was called “Bush’s war,” even though the Democrats voted hundreds of billions of dollars for the war budget, year after year. We in the Internationalist Clubs have a different view. We don’t call for a “new, improved” U.S. foreign policy, we’re for the defeat of the U.S. imperialist war, and we seek to bring down the whole imperialist system through international socialist revolution. These massacres of civilians are a common occurrence in Iraq and Afghanistan under U.S. occupation. The one in Baghdad shown on WikiLeaks came to the attention of the media because two of the victims were journalists for the Reuters news agency. What about all the others? It took three years for this video to be released, how long will it take to find out about all the atrocities the U.S. led forces have committed in the their terror war since 2001? In Afghanistan alone, where the U.S. has admitted it’s losing the war, there have been more than 2,000 civilians killed according to United Nations reports. In the early morning hours of last December 8, U.S. forces killed 15 civilians in Laghman province. This set off an angry protest of hundreds of residents of nearby villages who took to the streets carrying the bodies of the slain to place them in front of the governor’s house. During the protest, Afghan National Army (ANA) soldiers opened fire, killing one person. A day later, thousands of university students blocked the Kabul-Jalalabad highway protesting the killings. The official report from the NATO-led International Security Assistance Force (ISAF) claims that only “militants” were killed. 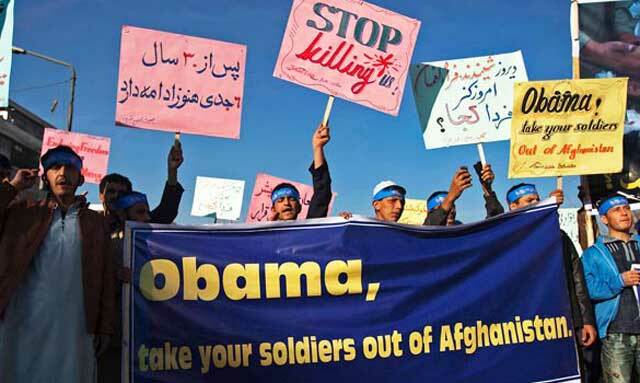 Again, demonstrators carried slogans against Obama, Afghan puppet president Hamid Karzai, U.S. forces and the Afghan army. A third protest took place in Kabul on December 10, carried out mostly by women, who were protesting against government corruption, war crimes and the Taliban. Out of all of these atrocious massacres of innocent lives – in many cases of women and children – the most chilling and sinister was the execution-style killing of eight children on December 27 in Ghazi Khan village in the Narang district of the eastern province of Kunar. These children in 6th, 9th and 10th grades were dragged out of their beds in the middle of the night, handcuffed and then shot (London Times, 31 December 2009). Recall that President Obama announced his decision to send 34,000 more troops to Afghanistan on December 1. This brings the U.S. total to 100,000, added to some 35,000 allied troops in the ISAF, and over 100,000 “contractors.” There were several protests the day after Obama spoke at West Point, but most – if not all – were tiny. In New York City at Times Square the protest only drew about 100 or so protestors. The organizers had no signs against Obama, even though he is the commander in chief of U.S. imperialism. But the CUNY Internationalist Clubs, along with the Internationalist Group and Class-Struggle Education Workers (CSEW), had the biggest visible contingent with bright signs denouncing Obama and the Democrats.